Girl Kuripot Girl Kuripot: @LangyawMedia @EstanCabigas, Win a Sandboarding Adventure for 4 in Ilocos! 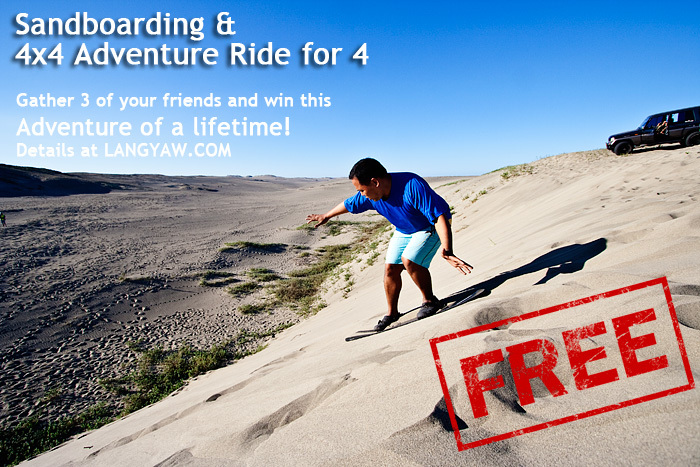 @LangyawMedia @EstanCabigas, Win a Sandboarding Adventure for 4 in Ilocos! This is a chance to win a sandboarding & 4x4 adventure ride for 4 at the Ilocos Norte Sand Dunes and an overnight stay in Laoag City! Join through the Rafflecopter. Tell your 3 friends to join. You have until May 20, 2014! Click here to join the Langyaw Media Estan Cabigas Laoag Eco-Adventure Development LEAD Movement Ilocos Sandboarding 4x4 Adventure Ride Giveaway. Win a 3D2N Trip for 2 to London! @BTAsiaPacific, Win a 3N Stay in Singapore! @Crimson_Alabang, Win 1 of 5 Overnight Stays! @magsPHofficial, Win a Trip for 2 to Bangkok! Are You the Next Miss Manila? Win Another Overnight Stay @TaalVistaHotel! Win an Overnight Stay @TaalVistaHotel!